We've been talking a lot on the blog recently, about what we think separates a good nonprofit from a great nonprofit. There are several crucial keys involved, but one that we want to talk about today is this: the ability to identify your unique differentiators. Now moving forward with that in mind, here are a few areas that you might start looking when defining your differentiators. What’s the size of your nonprofit? Can you say, we are the largest ________? Size often is a signal to potential donors and volunteers that you’re doing something right. Everyone wants to be a part of and give to something that’s really making a difference. Don’t let the size be your only focus, but if this is one way you stand out, it could be your differentiator. Does your nonprofit have a specific geographic focus? This used to be one of the most important differentiators a nonprofit could have. And to be honest, technology has made the world much smaller and location is less important than it used to be. However, there are still areas of the world that potential donors and volunteers just simply have a heart for. If you have a passion for serving a specific geographical location, it could easily be one of your differentiators. Focuses on HIV/AIds and water crisis in Africa. Does your nonprofit solve a specific challenge? The most successful nonprofits these days that have unstoppable momentum also often have a challenge they are singularly focused on. charity: water is one of my favorite nonprofits and a great example of this. They do one thing and they do it really well. They bring clean water to people in developing countries, specifically women and children. I can rattle that off quickly, because it’s specific and memorable. Does your nonprofit have a signature accomplishment? Can you say, “we were the first to ________”? Or, “We do more of 'XYZ' than anyone else.” If you’ve accomplished something that no one else, or at least few have, it will likely be one of your differentiators. Identifying your unique differentiators is so important to take your nonprofit from "good" to "great". It's how your organization will stand out and ultimately how you raise more funds to fuel your vision. 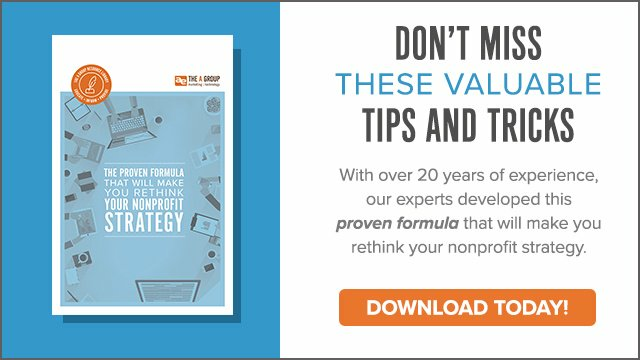 To learn the four other crucial pieces to our proven formula for nonprofit success, check out our FREE download below, The Proven Formula That Will Make You Rethink Your Nonprofit Strategy. It's chock-full of great tips, interactive content and checklists to make sure you are fully equipped as you lead your nonprofit.